It's really hot here in the big city when most people head out to the beaches scattered all over this sun-drenched archipelago. Being stuck here in Manila and looking for a different kind of high, I looked for a branch of Razons at Robinsons Galleria foodcourt that I later found out has a rather long queue (right photo furtively taken with my phone cam) attesting to the popularity of this ice concoction from Guagua, Pampanga. Other branches I know are SM Megamall Foodcourt, SM Mall of Asia (MOA) and the Shell complex on NLEX southbound. Halo-halo is a concoction of shaved ice, milk, sugar and various other sweet ingredients e.g. beans, purple yam, nata de coco, kaong (sugar palm) et al mixed together and sometimes topped with ice cream. The name itself literally means mix-mix in the vernacular. For a bit of trivia, halo-halo is not an original Filipino invention but was introduced by the Japanese and also influenced by the Chinese. Many people from the Land of the Rising Sun, settled in Mindanao particularly in Davao that’s why many residents there have Japanese-sounding names. The Japanese were also the ones who built the roads of Baguio particularly Kennon road where many Nihonjin migrant workers died during construction of that torturous road leading to the summer capital. Razon's version of the Filipino cooler is a simple one with only three main ingredients: macapuno (a sweet variety of coconut), sun-ripened handpicked saba (a certain variety of banana) and topped with syrupy, saccharine leche flan (steamed milk custard with caramel glaze) added together with finely-shaved ice, milk and a dash of dayap (lime) to complete the recipe. The halo-halo this time is paired with dinuguan (pork blood stew. hey, even the british have black pudding, the germans with their blutwurst and Americans with blood sausage, so Filipinos are not the only ones guilty of breaking the kosher laws), puto (Filipino rice cake) and pancit luglug. 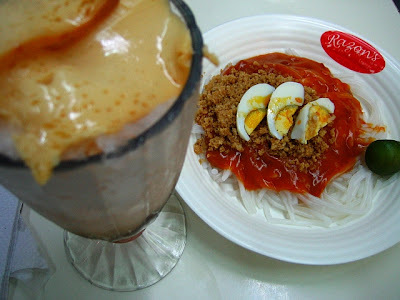 The pancit luglug, a close cousin of the palabok, is a common Pinoy comfort food made from round rice noodles smothered with special sauce, topped with boiled eggs and ground chicharon (an "evil" cholesterol-rich Pinoy food made of deep-fried pork fat that you may opt to avoid for those health-conscious. The Chicharon is what made foreigners think Philippine food is unhealthy, rather generalizing, isn't it?) and sprinkled with calamansi (Philippine lemon) for added zest. I always love the halo-halo of my hometown for its creamyness but Razon's halo-halo is a rare gem that makes the more visually-enticing Icebergs and Chowking's versions less gustatory appealing. lastly, their original Guagua branch, of course! Now this what I call a good summer meal, if there'd ever be one. I need that halo-halo! It is getting too hot here! I wouldn't say that Filipino food is very healthy. Too many people just fry everything in oil. In general I would say too much oil and too much fat. 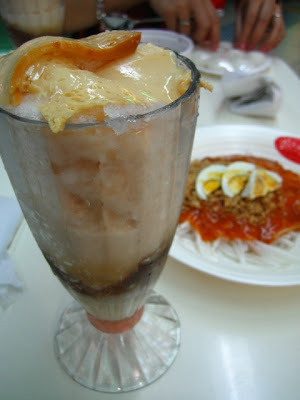 Razon's halo-halo is a winner! Especially during these sweltering times. Yum, I'm craving for it now. their ice is shaved finely kaya kapag hinalo mo na swabeng swabe sa lalamunan.. haha! they also have a branch in rob malate..
you're always in Bicol, right? did you know that the Bicol region has the lowest incidence of heart attacks in the Philippines attributed to their cuisine mostly of coconuts? The coconut, a victim of American negative campaigns particularly supporters of canola and palm oil, is not that evil as those campaigners inculcated in the minds of many people. also, in other parts of this country, this highly diverse archipelago, there are many different ways of cooking. You have to take a closer look if you need to. noticed hotels here serving western food? Hello Tito...wow naman nagutom tuloy ako haha madaling araw pa naman ngayon, saan kaya ako kukuha ng halo halo dito sa america? Sabihin mo kaya dun sa razon, ay magtayo na rin dito he he he...napuntahan mo na ba yung nasa greenhills na Razon? Sa tapat ng supermarket ? sus ginoo, nalimutan ko na ang pangalan haha musta na? nag-sign up ka pa just to comment? hehe...sarap halo-halo, no? Don't get me wrong. Indeed the food is very good here and as you point out there is th inihaw and the sabaw. The problem is that many people seems to fry a lot because it is quick and it doesn't demand a lot of knowledge. parang ang sarap. di ko pa na try dyan. my friend was saying the other day that he feels guilty after eating so much. i said it was not guilt but more of symptoms of clogging arteries. they also have a branch in shopwise, cubao. Razon's is by far the best halo-halo I've had.. YUMMY! 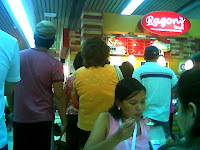 I wonder if Razon's halo-halo is open for franchise. I'm interested in it. frankly speaking, most restaurants serving halo-halo here have been trying to copy and discover the secret of their shaved ice. See how Chowking improved on theirs lately? razons, meron din sa makati, sa foodcourt diyan malapit sa SM ba yun, ah basta nakakain ako ng halo-halo dun, desert ko kasi kumain ako sa Bacolod Chicken Inasal sa tapat lang. What's the difference between Pancit Luglug, Pancit Palabok & Pancit Malabon? itchie, AFAIK, palabok uses thin noodles than luglug and malabon (pansit malabon is obvious to be from malabon plus the toppings are more than pansit luglug). I love palabok but not much malabon and luglug for the twohave thick noodles thus heavier than palabok. http://micjpalomar34@yahoo.com May I know what's the franchise fee? My sister and I brought a senior balikbayan friend to Razon’s at SM North Edsa for Palabok and Halo-Halo. All three of us are senior citizens. When my balikbayan friend was about to eat her Halo-Halo, she found a ‘langaw’/fly, floating in her cup of Halo-Halo. We informed the waiter and he went to Razon’s booth to relay this to Razon’s attending manager. We were totally ignored, no apology, or replacement of the Halo-Halo. What a BIG disappointment! So unprofessional! Very unsanitary!